Here’s something I wrote a while back when trying to convince the team that our online racing game should allow for ugly characters. Does it convince you? Online games dependent on micro-transactions and purchase of items must create and maintain a compelling library of buyable content. Generally this content is geared towards improving playerâ€™s abilities in-game, either upgrading performance of a vehicle, allowing access to a bigger weapon, or resupplying ammo/fuel for those weapons and vehicles. Purchases can also be purely cosmetic â€“ improving Playerâ€™s outfit, hair style, or physique. Play imbalance is created when Players with money are able to purchase upgrades that improve their in-game ability. This influences their win/lose ratio, making it possible for inferior Player to defeat superior Players, simply because they spent money. In a system like this it is impossible to maintain a culture of fairness. Every defeat is â€œunfairâ€ because the opponent likely used a purchased upgrade to attain it. Every win is â€œhollowâ€ because no real skill was used in attaining it. It is agreed that in a fair and balanced PvP environment purchased items should not upgrade or influence a Playerâ€™s ability to win. This means purchased items are purely cosmetic. This question goes to the root of all purchases, virtual or real. Purchased items fall into two categories: â€œNecessities for Survivalâ€ (needs) or â€œItems of Desireâ€ (wants). Necessities for Survival include food, clothing, shelter, medicine. Items of desire include jewelry, designer clothes, and general â€œluxuryâ€ objects. Necessities are things every person needs to survive. Items of desire only matter in context of a social group. Marketing tells us we need objects in order to be better people, feel better about ourselves, and impress our peers. If not for marketing, every person in the world might exist on the same basic set of durable goods. Marketing tells us we arenâ€™t enough, that more is needed to be â€œcompleteâ€. As such, purchasing is ultimately driven by fear. In-game the ability to visually register the material worth of a character is limited. How can I know the worth of your shoes upon immediate inspection? Solution: Our brains have evolved to be powerful facial characteristic readers. We are walking face â€œvalue scannersâ€. A game geared towards the creation and maintenance of facial â€œvalueâ€ taps into this most basic skill of the human brain. Facial beauty is a function of ratios and relational harmonies. A character creation system with built-in flaws limits Player to creating only ugly faces. Real-world marketing tells us their products will make us more beautiful, more handsome â€“ but without radical and expensive surgery these promises are unattainable. In a virtual environment, the promise can be a reality. 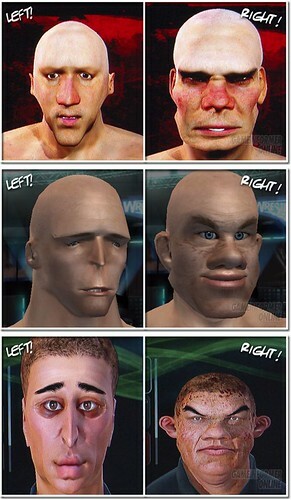 Typical facial creation systems assume Player will build a face at the start of the game and then leave it until the end. By linking the facial manipulation mechanic into the store we create a constant driver to spend time/money on making a player character more and more attractive. The promise of all those marketing campaigns becomes a reality. Races (crashes specifically) will deliver damage to Player Characterâ€™s face, clothing and body. This way we create an instantly recognizable value system within the game which can be monetized through make-up, insurance, surgery and more. Image reference for ugly characters taken from this Game Informer article.